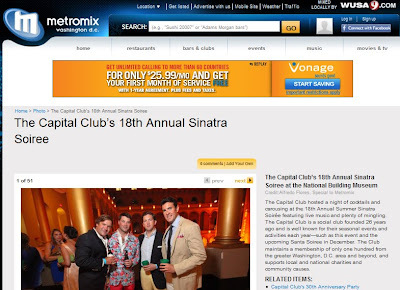 The Capital Club hosted a night of cocktails and carousing at the 18th Annual Summer Sinatra Soirée featuring live music and plenty of mingling. The Capital Club is a social club founded 26 years ago and is well known for their seasonal events and activities each year—such as this event and the upcoming Santa Soiree in December. The Club maintains a membership of only one hundred from the greater Washington, D.C. area and beyond, and supports local and national charities and community causes.